Explore vibrant Guatemala City before crossing the border into Honduras to uncover the ruins of Copan. Discover Quiriguá's Mayan legacy before cruising on the Rio Dulce and soaking up the Caribbean flavours of Livingston. Let Flores charm you before exploring the ruins of majestic Tikal. Admire the glistening waters of Lake Atitlan and end your adventure in Antigua Guatemala. Private boat ride in Panajachel & Rio Dulce. Drinks, tips, border crossings * or any concept not mentioned in the price includes. * The border crossing to Honduras is not included and costs approximately $30 for single entry. Arrive at your UK departure airport, ready for a flight to Guatemala. 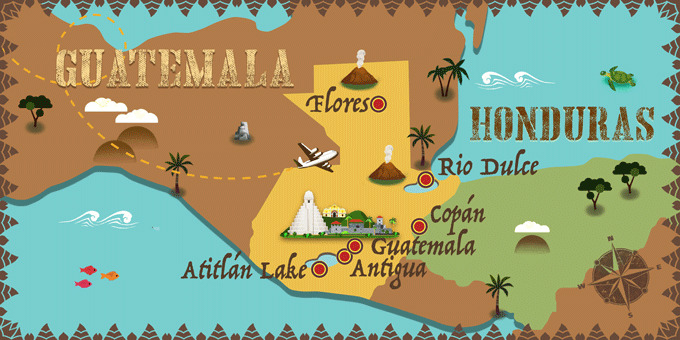 Arrive in Guatemala City, the capital of Guatemala, known for its volcanoes, mountainous location and Inca heritage. Transfer to the hotel and overnight stay in Guatemala City. Breakfast at the hotel. Set off for the Northeast of Guatemala, and cross the border to Copan, in Honduras. In the afternoon, visit Copan Archaeological Site considered one of the most important in the Mayan World. Tour the complex with its sculpted stelae slabs, a stairway with Mayan glyphs and the impressive ball field. Overnight stay in Copan. Breakfast at the hotel. Return to Guatemala and visit the Quiriguá Archaeological Park, located on the banks of the Motagua River. The park is comprised of a complex of stela slabs, sculpted in sandstone, among which is the tallest stele of the entire Mayan world, as well as zoomorphic figures that date from the classic period of the Mayans. Afterwards, transfer to Rio Dulce an area of immense natural beauty. Overnight stay in Rio Dulce. Breakfast at the hotel. Board a board on the river and head to the town of Livingston, known for its reggae music and coconut bread. Continue up the river and admire the exuberant vegetation and an amazing natural canyon. From the boat enjoy a panoramic tour of the Castle of San Felipe de Lara, a fortress built in the seventeenth century by the Spanish. Afterwards, transfer to Flores, situated on an island on Lake Petén Itzá. Overnight stay in Flores. Breakfast at the hotel. Today explore the most important Archaeological Site of the Mayan world, Tikal, built during the classic Mayan period. Your guide will show you the model of the Temples and Acropolis complex and guide your visit of the Q and R Complex, the Central Acropolis, the Temples I "The Great Jaguar" and the Temple II "of Los Mascarones". Enjoy lunch at Tikal before transferring to the Mundo Maya Airport to take a flight back to Guatemala. Transfer to the hotel and overnight stay in Guatemala City. Breakfast at the hotel. Seize the day with an early morning visit to Chichicastenango market, located in the central Guatemalan highlands and visit the local Church of Santo Tomas. Transfer to Lake Atitlan, surrounded by three volcanoes Atitlán, Tolimán and San Pedro. Its crystal clear waters are amazingly beautiful. Enjoy a panoramic tour of Panajachel. Transfer to the hotel and overnight stay in Atitlan Lake. Breakfast at the hotel. In the morning, take a boat ride to the indigenous village of Santiago Atitlán, located between the volcanoes Tolimán and San Pedro. Explore the town and visit the church of Santiago Apóstol and the Brotherhood of Maximón, one of the expressions of religious syncretism in our country. Return to Panajachel and transfer to Antigua Guatemala. Overnight stay in Antigua. Breakfast at the hotel. Today, enjoy a full-day tour of Antigua and visit the most important ruins of the Colonial City, declared Cultural Heritage of Humanity and considered one of the most beautiful colonial cities of America. During the colonial period, it was the capital of the Kingdom of Guatemala and included the provinces of southern Mexico, Guatemala, El Salvador, Honduras, Nicaragua and Costa Rica. After an earthquake in 1773, the city was uninhabited the population moved to what is now Guatemala City. In the afternoon visit San Juan del Obispo and Santa María de Jesús. Overnight stay in Antigua.